Lesson 5 in the Teacher's Manual. - iris: the colored part of the eye. - pupil: the dark circle in the center of the eye. The pupil is an opening that lets light enter the eye. - reflex: a quick, unplanned response. To move, many parts of our bodies must work together. Nerves carry signals to our muscles to move parts of our body. Reflexes are our bodies' built in actions that happen quickly without having to think about them. They are important because they can keep us out of trouble and prevent us from harm. Pupil dilation is a common reflex. The Blink Reflex is an attempt to protect our eyes from things that might damage them. 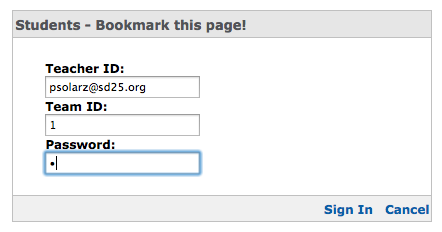 Sign in to Science Companion Prime with your d25 sign-on and your password. 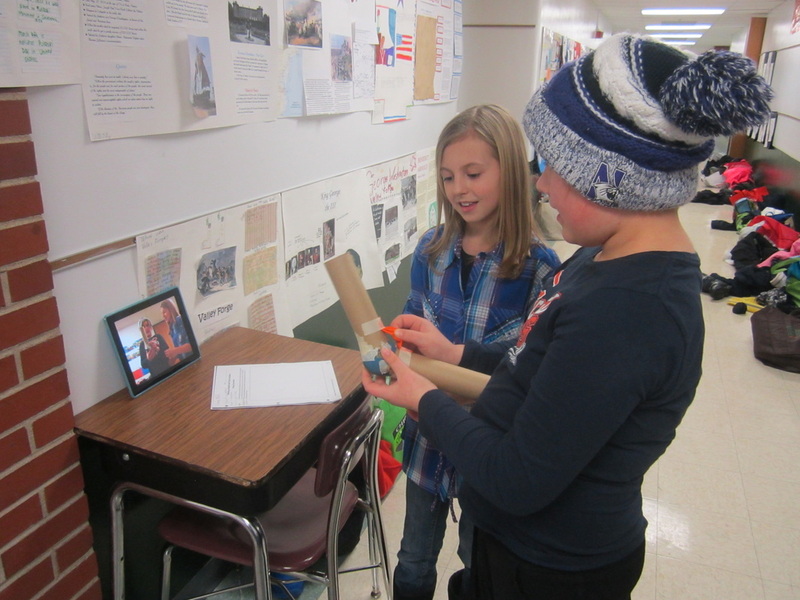 Use an iPad to take a very short video of this activity. Upload it to YouTube. Embed it on this blog entry. Take screen shots of all of the questions and answers & put them on a blog entry entitled, "Moving Quickly to Prevent Harm." 1. Can you feel it when your pupils dilate? 2. Do you have any control over your pupils when they dilate? 3. What do we call this when a reflex happens without our control? 4. Why do our pupils get bigger in the dark and smaller in the light? 5. How does this reflex protect our eyes? Remember to follow the directions, complete the activities & questions online, take screen shots, and create your blog entry. You will need to read the pages in your SRB. Was it more difficult to catch the ruler using one of the senses as compared to the other? Explain. How could you use only the sense of smell to catch the ruler? How could you use only the sense of taste to catch the ruler? Explain how your senses, nerves, brain, and muscles in your fingers helped you to catch the ruler for one of the senses explored. Use pages 17-23 of your student reference book to help you. 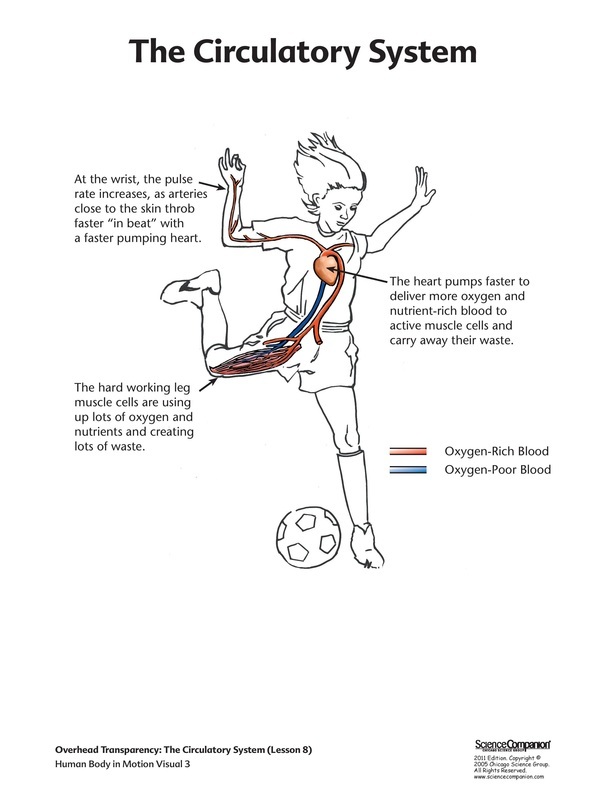 How did your body respond when the ball of paper was thrown at you? How would this reflex protect your eyes if the transparency had not been there? Do you think the nervous system responded to catching the ruler and blinking in the same way? Why or why not? Were the senses used in both? Were muscles used in both? Did you have to think about both actions? Lesson 10 - pages 164-175 in Teacher's Manual. Sign in to Science Companion Prime with your d25 sign-on and your 151 _ _ _ _ password. To move, many parts of our bodies must work together. To produce the energy needed for movement, muscle cells need a constant supply of oxygen, nutrients, and water. Have you ever felt hungry after being physical (like a soccer game, swim meet, etc.)? Why do you think we get hungry after exercise? What do our cells need to stay healthy? How does the food we eat get to the cells in our body? Discuss the Digestive Process with this visual. Why does food need to be digested? What is the purpose of the Digestive System? digestion: the process of breaking down food into simpler forms. digestive system: the body system that breaks down the food we eat so our bodies can use it for energy and other needs. enzymes: Chemicals that break down large, complex food particles into smaller, simpler nutrients. Explain directions. Don't stir too hard, or you'll rip your coffee filter! Use sticks to create groups of four. Have students complete the chart and questions while the lab is taking place. Use this Countdown Timer to keep track of time. Keep the volume LOW, please. Read SRB pages 81-88 while your simulated digestion is happening. Take screen shots of the charts and all questions and answers. Put them into a blog post entitled, "How Our Muscles Get Nutrients." Does the amount of enzyme (meat tenderizer) affect the rate of digestion (how fast it digests)? Does the temperature of the gelatin affect the rate of digestion (how fast it digests)? Does physical digestion (breaking down food into smaller pieces by chewing or cutting) affect the rate of digestion (how fast it digests)? So what happened to the gelatin that touched the enzyme (meat tenderizer)? What happened to the gelatin that wasn't touched by the enzyme (meat tenderizer)? Lesson 9 - Teacher's Manual pages 152-163. 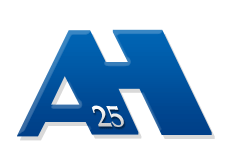 Sign in using your d25 sign-in and sd25 _ _ _ _ password. Put your hands on your rib cage while breathing in and out. Explain what the lungs are doing during inhalation and exhalation. breathing rate: the number of times you breathe in and out in one minute. carbon dioxide: a waste product made by cells that is removed from our blood and lungs when we exhale. diaphragm: a large muscle just below the lungs. Air empties or fills our lungs when our diaphragms move. lungs: the main organs of the respiratory system. Our lungs deliver oxygen to the blood and remove carbon dioxide from the blood. respiratory system: the body system that brings oxygen into our bodies and removes carbon dioxide from our bodies. What effect do you think exercise will have on breathing rate? Show me some activities that will keep your breathing rate slow. Show me some activities that will increase your breathing rate. Why did your breathing rate increase? 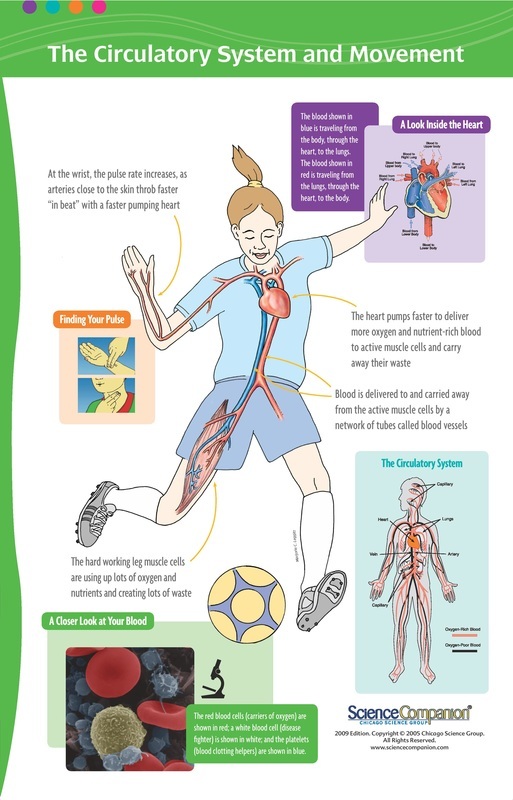 Discuss how air flows in our body with the poster. Partner students up with sticks. While you wait for others to finish, research breathing problems like asthma. Be ready to experience why they have trouble breathing and what it feels like. Create a new blog entry entitled, "Breathing Hard for Our Muscles." Do the activity using these directions or try these. Take screen shots of each question & answer and put it into the blog entry. What did breathing through straws represent? Why should we have this experience? It was difficult to continue moving when you breathed through the straw. Why is that? What are some things that affect the respiratory system and make it harder to breathe? How would your daily life be affected if you could only breathe in small amounts of air with each breath? - Complete "Your Beating Heart" activity. 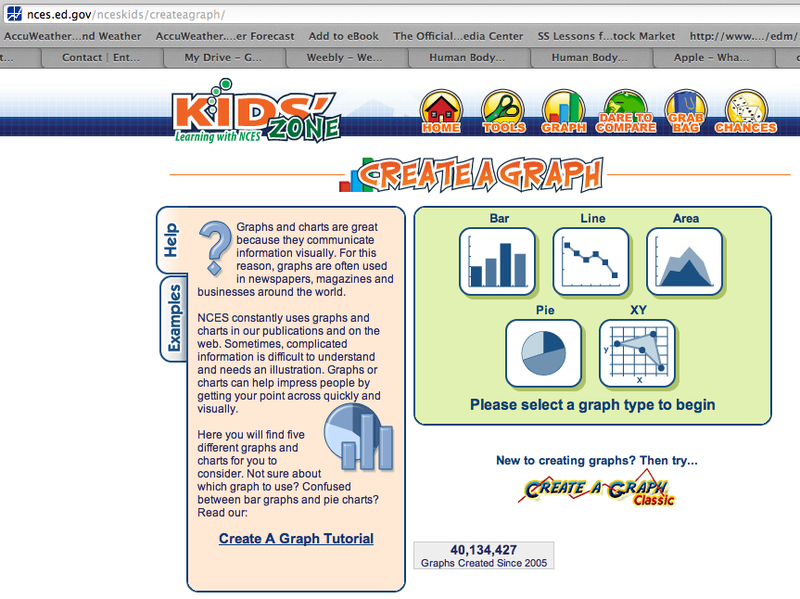 - Create a graph of your data on Create-A-Graph. - Save the graph as a JPG. - Embed it on a blog entry entitled, "Delivering What Muscles Need." Write a reflection paragraph regarding this activity. Then answer each question below with more than one sentence each. Which activities increased your heart rate the most? Which activities increased your heart rate the least? Was the order in which you ranked the activities accurate? (It's good to be wrong!) Explain. What changes did you notice about your heart rate as you became more active? - If there is extra time, go over the Circulatory System poster. - Have a discussion about the Circulatory System. - Have kids read Chapter 7 in their SRB's. Muscles shorten, or contract, to move bones. Muscles can only pull; they cannot push. Muscles often work in pairs. Would your muscles get tired? Why or why not? In today's activity, we are going to find out exactly what would happen if you exercise a muscle too much. Do page 132 in Teacher's Manual. Each partnership needs a clothespin. I can operate the online stopwatch for the whole class. Describe the technique for using the clothespins. Explain rules and how to count. 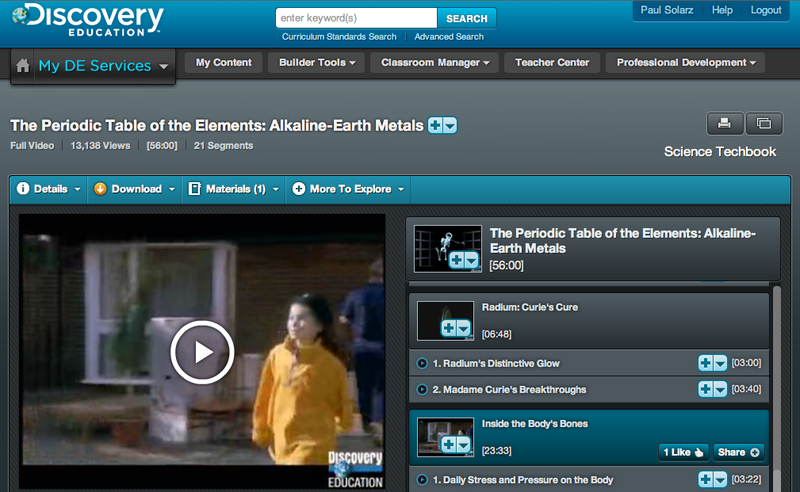 Students need to record information on pages 22-26 in their Science Notebooks. Graph data on Create-A-Graph and post graphs on blogs. Was it difficult to use the same technique throughout the whole experiment? How did you hands and fingers feel BEFORE, DURING, and AFTER the experiment? Describe how your data changed over time. What errors or inconsistencies might have affected your results? Why did your hand strength change over the course of this experiment? How do you think your muscle cells get oxygen, nutrients, and water to make the energy they need to function? What do you think you could have done to prevent your muscles from tiring? What should you do if you experience muscle fatigue in the future? Read pages 49-55 in your SRB's. Pass out pages 9-12 from Science Notebook (or hand out consumables). 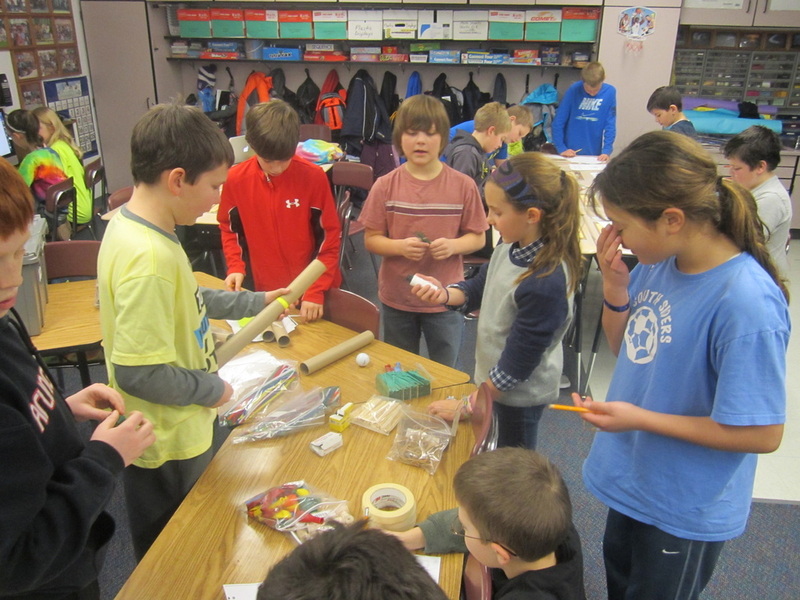 Introduce the activity and explain supplies. Have students complete pages 9-12 before choosing supplies. Make sure they know what all the terms on the board mean. When done, check in with Mr. Solarz to preview what you will record and get feedback. - How many bones did your model need? How many muscles did it need? - How were your pretend muscles similar to real muscles? Different? - What changes occur to the real muscles in the human body to make them pull on bones? - What would happen if the ligaments of the models were overstretched or torn? How would it affect the way the models could operate? What moves the bones of our bodies? Do they move on their own or does something else move them? Bend and straighten your arms. Can you feel your muscles moving? What changes when you flex and unflex? Need volunteers for a demonstration. How do you think these muscles move? Show me. Where are the muscles attached in order to do this? Work together to show how we flex and unflex our arm muscles. Muscles can only pull on bones, they cannot push. Limb bones are moved by muscles working in pairs. Read SRB pages through page 15 with partners to get ready for tomorrow's lesson. This is Lesson 6 in the Teacher's Manual (pages 116-127). Show chicken bones & let kids touch them. Why is one bendable and soft? How would soft, bendable bones affect movement in our body? Would the skeleton be able to do its job? What does a bone need to be hard and strong? Use Proscopes to examine soup bone cross-sections. Record observations (and a photograph with the Proscope) in a blog entry entitled, "A cross-section of a bone." Remind them of the apple lesson - push yourself to find good observations. Have students Google the following and summarize the answer in their blog entry, "How does vinegar remove calcium from bones?" What happens to bones that don't have enough calcium? How are they effected? What are the consequences to the rest of the body? Why do bones need calcium? How is it used? What can we do to keep our bones healthy? What other things besides calcium do bone cells need to function properly? Bones are made up of unique cells important to movement. To produce energy and function properly, all cells need a constant supply of oxygen, nutrients, and water. This is Lesson 2 in the Teacher's Guide (pages 66-79). Do the Skeletal System & Joints Slide Shows (to the right). Read SRB pages 1-5 together as a class. Show the three joints from the kit. Show any iPad apps or websites that demonstrate joints. Play Simon Says using the Skeleton as a guide. Solve the riddles on pages 5-7 in partnerships. Which joint is most important, 2nd, 3rd, etc.? Use the Intel Ranking Tool for this part of the lesson. Your Team ID is your number in our classroom. Your Password is your number in our classroom! Have students take a screenshot of our Rankings and answer the following questions in a blog entry entitled, "Which Joints Are Most Important?" To move, many parts of our bodies must work together. Muscles move our skeletons by pulling on bones that meet at joints. 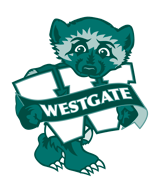 Click on the image above to go to the Student Sign-In Page. Which joint did you choose as our most important joint? Why did you choose that joint? What things would be difficult to do without that joint? R: Role: You are one of the joints in your body (your choice)! A: Audience: Your audience is you! F: Format: A persuasive letter! T: Topic: Trying to get you to go easier on them! Your joint is writing a persuasive letter to you, asking you to be kinder to it by doing (or not doing) several things. Can you write from that perspective? Can the joint be persuasive enough to get you to treat it better? Think about eating, carrying things, what you are wearing, sitting, lifting, exercising, playing sports, etc. What simple things could you do during your daily routine that would protect your joints? Have fun writing! 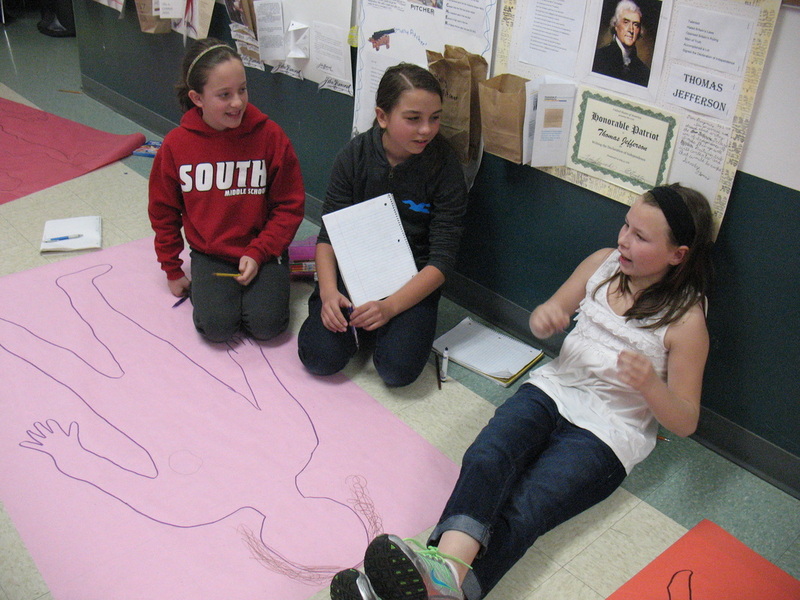 If you finish early, check out these fun Skeletal System websites! This is Lesson 1 in the Teacher's Manual (pages 54-65). Distribute the notebooks (or do this on blogs). Partner everyone up with sticks. Do running/jumping jacks activity, then complete page 2 in notebooks (or on blogs). Discuss the need for food, water, sleep, and energy. Complete pages 3-4 in notebooks. Demonstrate how to use Create-a-Graph to make a bar graph. Use the data from this activity to see how many people noticed each trait of exertion. Have students place a screenshot of this graph on their blogs. Title these blog entries, "Signs of Exertion." To move, many parts of our bodies must work together. What three basic things do our bodies need in order survive? If we exert ourselves, what are three (or more) signs that our bodies are in distress? Explain why our body does that (research it if you need to). What can we do to make these signs go away? Today, our goal is to learn how to deeply observe something and describe it in words so others understand. We will be using a half of an apple. You should be surprised by your observations if you are doing it right! Make sure that you write with specific words, don't be general! Think of all of your senses (except taste - we're not allowed to eat our science experiments in District 25!). After about 15 minutes of notes, you can use tools to observe further. 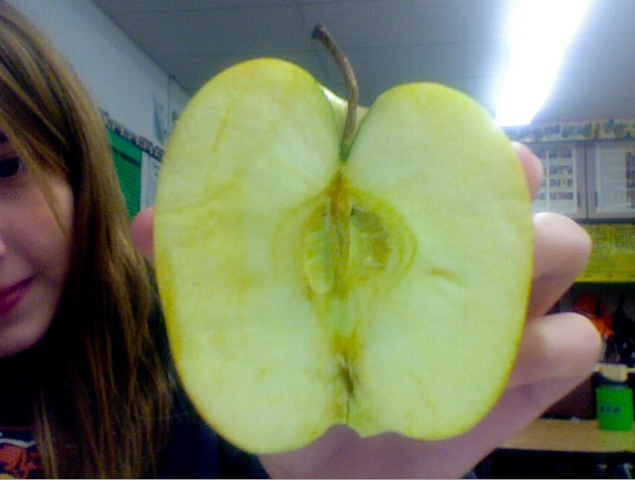 Record all of your observations on a blog entry called, "Observing and Describing an Apple." Why were you able to observe so many things about your apple today? Why is observation and description so important in science? Rank order the five senses in the order or your observations (i.e. which sense was used most, second most, etc.). I have used Doctopus to give you all two different Google Docs. That means that each document has already been shared with me! So I will be able to watch your progress on this project and give you advice along the way. One is a Google Spreadsheet that has all six systems that we will be learning about this year, how each system can be organized into paragraphs, and the specific parts of each system that need to be explained. This will be used to organize all of your notes that you get while researching. 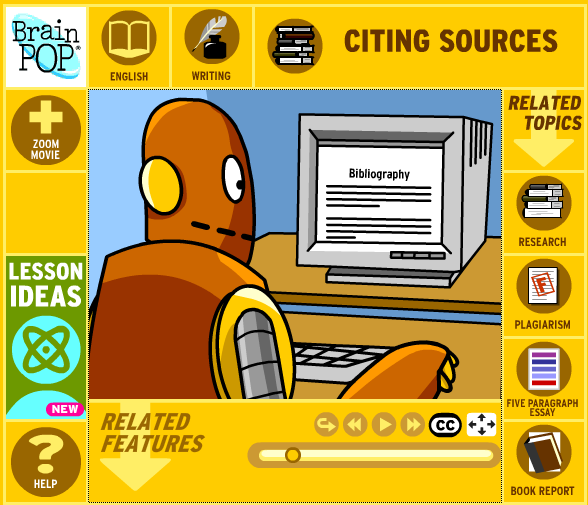 It will also contain all of your Bibliography information, so we can give proper credit to the sources we use. 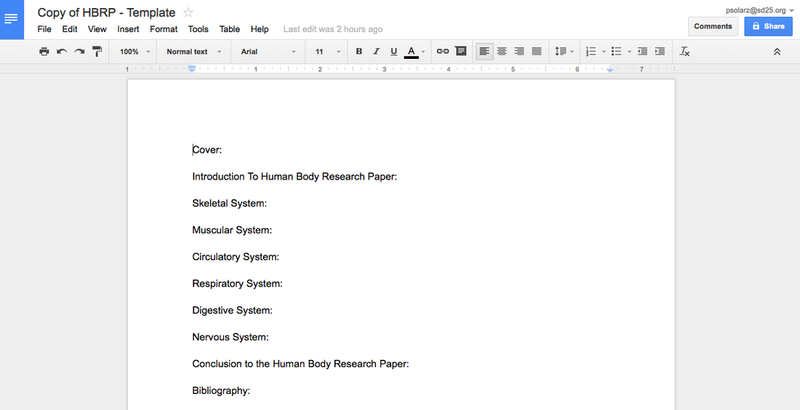 The other document is a Google Document that you will use to write your Human Body Research Paper in your own words! I have already typed in the different section titles (which will each be at least one page long). Lesson 11: Teacher's Book pages 176-189. Use the spotlight and search "Human Body". Go to "Posters". This is the last one. The human body is made up of many different types of cells. Each type of cell has unique characteristics for performing a specific "job." Talk about how cells each have a different job to do. 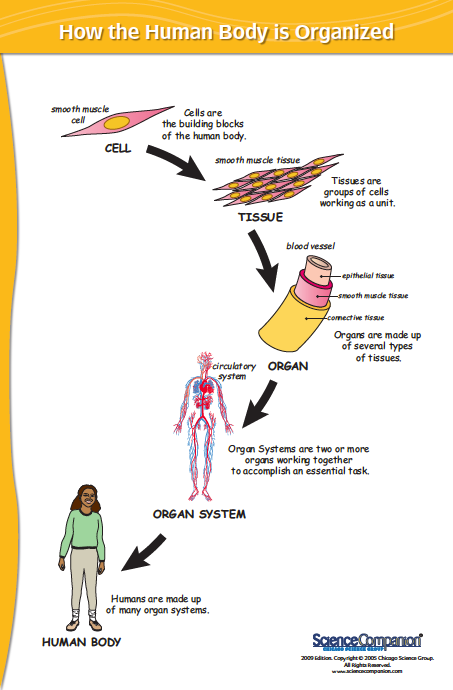 Cells form tissues, tissues for organs, organs form systems, and the systems work together to keep us alive! Aliens would most likely not look like us because their environment would likely be very different. What changes would likely need to happen on humans if gravity was 4 times stronger? What changes would likely need to happen on humans if oxygen was 5 times more scarce? 1. 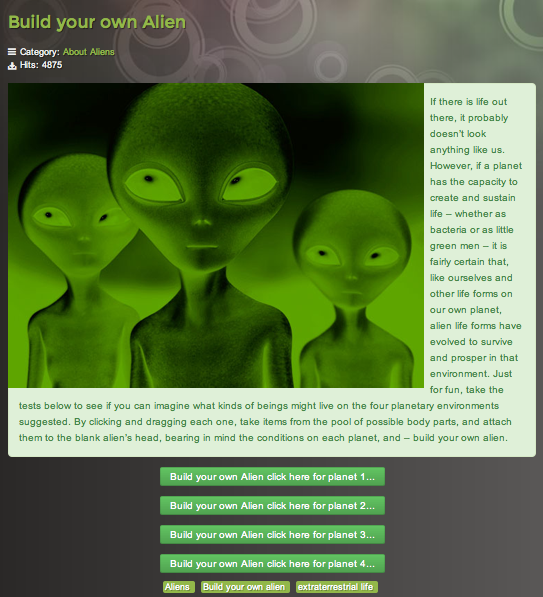 Create a blog entry called, "How Might Humans and Aliens Be Different?" 2. Take a whole-body picture of yourself using PhotoBooth and upload it to your blog entry. Insert a "Column" and put your photo of you on the left side. Put a title above that says, "Humans." 3. Drag in a "Text" below your picture and list some examples of how humans have adapted to our planet and our needs (i.e. Our gravity allows us to walk on two legs. Our ears are on both sides of our head so we can hear all around us. Our eyes work better in the daytime, because we generally sleep at night.). 4. Go to this website, choose any of the four planets, and read the characteristics of that planet (on the left side of the screen). Then, create an alien based on the planet's conditions. Start by adding all of the parts possible. Take off one part and see if it still survives. Keep taking off parts until you know what it needs to survive. 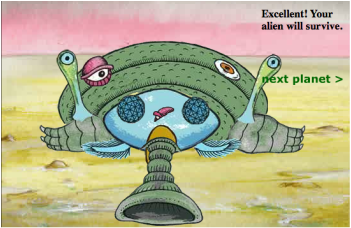 The student who has an alien with the least number of parts (who can survive on that planet), wins! 5. Take a screen shot of your surviving alien. Drag it into the right side of the column on your blog entry. Above it, place a "Title" called "Aliens." 1. Compare and contrast your alien and a human. What similarities do they have and what differences do they have? These should be related to the parts of their bodies that have a specific purpose (Example: Both have feet which help them both stand straight up.) Try to be specific and explain things with detail. If you want some help with this activity, read the article below the "Read More" link. 1. Create a poster that contains the following organs (in the correct spots and approximately the correct size) without using any resources! 2. With the other members of your group, create a video explaining where each organ is and what you think it does for our body. Make sure everyone gets equal talking time on the video. Each member of the group should make a blog entry called: "Human Body Pre-Test." Embed the video at the top of the blog entry. What was the hardest part of this activity? Which organs do you think you put in the right places? Which organs do you think are probably in the wrong place? 4. If you have extra time, research to find out what you did correctly and what you did incorrectly! 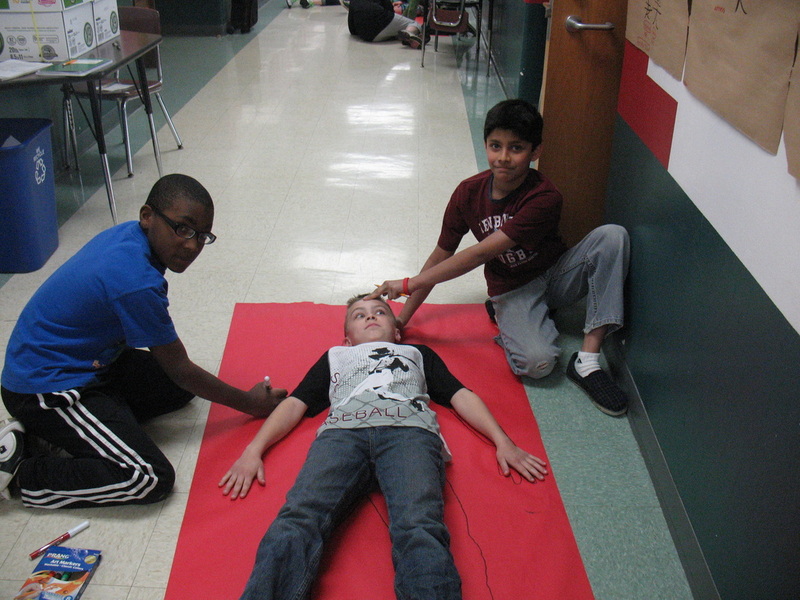 The Human Body in Motion Unit gives students a view inside their bodies to see how they move. They discover that movement, like all bodily functions, requires many parts of the body to work together. 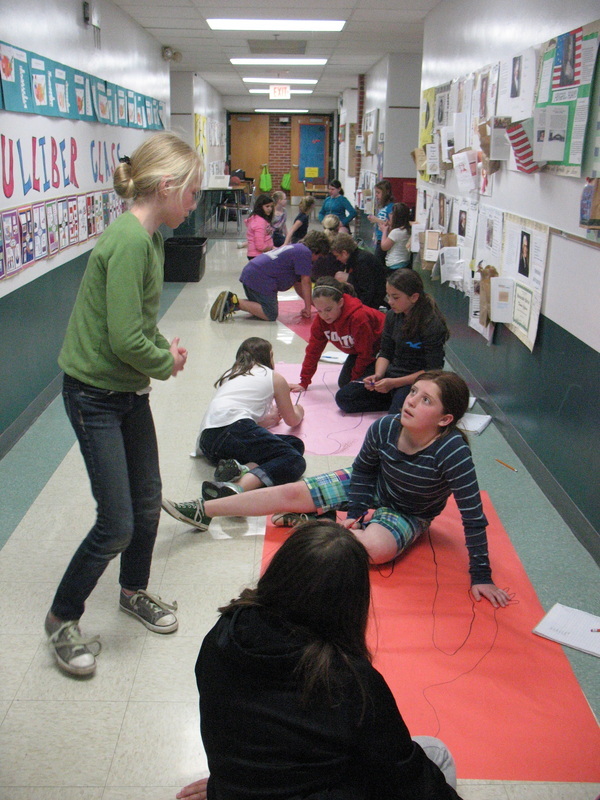 Students explore the skeletal, muscular, nervous, circulatory, respiratory, and digestive systems to uncover the specific role each plays in bringing about movement. They come to appreciate the complex intricacies and dependencies between parts of their bodies and learn what they can do to maintain and protect these parts.